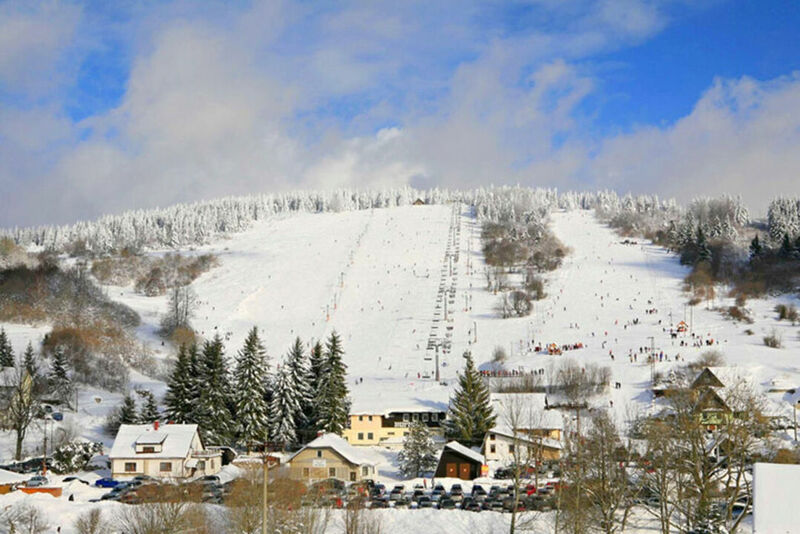 The ski resort Ski Krahule is situated in the Kremnické vrchy Mountains in the Turiec-Kremnicko region. Not far from the resort is "the geographical centre of Europe" visited by many tourists and the town of Kremnica. There is a 4-seater chairlift and four ski lifts in the ski resort Ski Krahule. There is also a 100m long children's rope tow, which is free. The chairlift provides access to one easy and two moderately difficult ski runs, 800 to 900m and a super elevation of 170m. The total length of ski runs is 3km. The slopes facing the south are ideal for families with children. Enjoy wonderful views of the Žiarska kotlina basin, the Štiavnické vrchy Mountains and the Vtáčnik Mountains, directly from your sun loungers from the upper chairlift station at an altitude of 1060m. On the slope there is a restaurant and two huts with internet WiFi. Services at the resort include ski rental and ski and snowboard servicing, ski school and snowboard school.